Impressions and Reflections features artworks by Madison Winters and father David Winters. 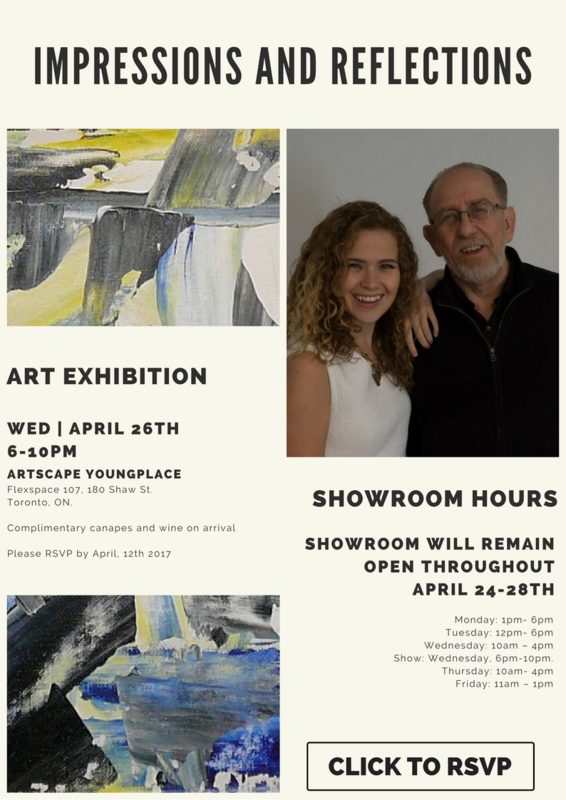 RSVP to the exhibition show on Wednesday, April 26 from 6:00-10:00 PM here. David was born in Port Arthur (now part of Thunder Bay) and raised in Schreiber, Ontario. The oldest of nine children, he attended primary school and high school in Schreiber and left the area in 1969 to study Architectural Technology at Ryerson Polytechnical Institute in Toronto. After three years of working in construction and then at Ontario Hydro as an exhibit designer, David enrolled at the Ontario College of Art to study Environmental Design (Interiors). In the late nineties he enrolled in and completed the Facilities Management certificate program at Ryerson University in Toronto. As a youngster David was always interested in drawing and painting and started lessons early with Iris Lidkea, a local artist in Schreiber. In the early 2000’s David and his daughter Madison decided to take art classes together with Toronto artist Dianne Koci. Both David and Madison mounted exhibitions in Toronto, and David exhibited in Elmira Ontario as well. Upon retiring David began to paint full time and has exhibited frequently in Schreiber and Thunder Bay ON. Since March, 2015, Edgeview Restaurant in Nipigon ON has hosted a continually changing show of his paintings. David is a member of artist run Definitely Superior Art Gallery (Defsup) www.definitelysuperior.comand his work has been included in many Defsup shows and events. He paints abstract, impressionism, landscape and portrait pieces in acrylic on canvas, hardboard and plywood. Madison was fortunate enough to grow up and live in downtown Toronto for her entire life. Being exposed to so many cultures, ways of life, food, art, and communities has impacted her lifestyle and values. She will be forever grateful to her mom and dad for letting her experience the beauty of Toronto, the arts, and self-exploration. From a young age, Madison has been inspired by creativity; whether it was performing arts, calligraphy, jewelry design, pottery, or painting. Madison has studied acrylic, oil, and water colour painting for upwards of a decade with private teachers and independently. Her first art show at the age of 15 was a success with over 15 paintings and commissions sold. Although she never went to school for art, it has remained a beloved hobby and form of self-expression throughout her life.